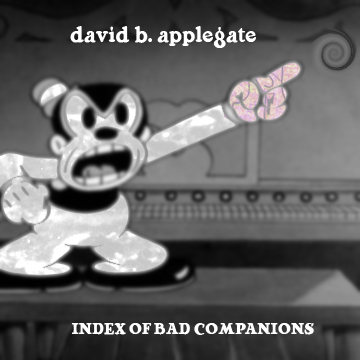 Brooklyn-based sound wrecker David B. Applegate returns with Index of Bad Companions. These seven mutilated tracks eliminate techno’s map; damaged waveforms and deranged rhythms slip on and off the grid tugging the edges of electronic music’s mouth into a demented smile. Inspired equally by the surreal elasticity of Saturday morning cartoons and the unconstrained energy of free jazz, this record punches a hole in the fabric of the everyday to reveal a world distorted and distended into mutant sound-shapes spewing a unique flavor of multi-hued ruckus.